Continuing on with my pledge to keep my feet on the ground(ish!) for at least a couple weeks of Fab Fives, today we're talking bath towels which firmly fall into the practical category, but that doesn't need they have to boring. Reasonably priced, good quality bath towels are thankfully easy to find these days, but they often tend to be a bit on the safe side of the colour spectrum, and quite plain. Not that there's anything wrong with plain towels - there's nothing quite like a super-plush bright white hotel towel, is there? But if you're buying them for your home, why not have a bit more fun with them? Besides, whites don't always stay so white in a domestic situation, or get laundered every day for that matter. 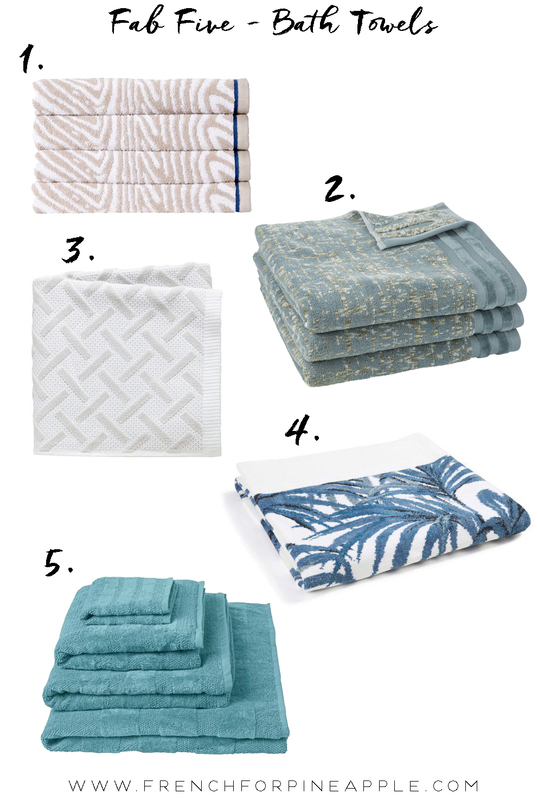 I love buying new towels, but it doesn't happen very often, and researching this post has got me all worked up into a pretty towel frenzy. You might know I'm not a fan of our main bathroom, and a pretty towel goes a long way to distract one from a less than perfect bathroom. So I kind of 'need' new towels for that reason, because it doesn't look like that bathroom is getting ripped out any time soon. And if you luckily already have a perfect bathroom, well, then you still need pretty towels to complete it.